And, as many a parent before me, I struggle with an answer to this kind of attention. Yes, it is very difficult for Esmé and for those who love her. Yes, I wish my child didn’t have to endure seizures, aspiration, countless blood draws and way too many hospital stays. But I don’t feel sorry for us. I mean I do sometimes (like everyone else in the world) slip into sadness and sorrow. Sometimes at the sight of photos of my friends’ beach vacations or milestone announcements I find myself struggling with anger, jealousy, and fear. But this is not the defining feature of my experience as Esmé’s mother. What I don’t think many people understand about having a child like Esmé—who has had to work so hard to grow and breathe and move and communicate, but who greets the world with a smile almost all the time—is the awe and respect with which I view my child. Esmé’s spirit is single-handedly the strongest, most determined, goofy, loving spirit I have ever encountered. Yeah, I know, I’m her mom…but it is true. And other people see it too. And in this way, Esmé is my advocate as much as I am hers. 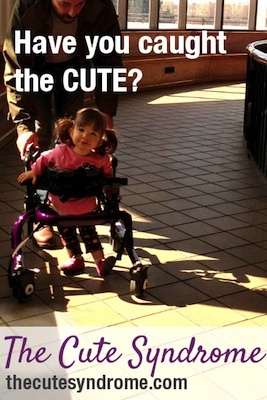 About a year ago I started a blog called The Cute Syndrome. I had been writing letters to Esmé privately since before her birth, but with my decision to put my doctorate and teaching career on hold in order to care for Esmé full-time came a very strong desire to put my words out into the world. I wanted people to understand more about what it was like having Esmé in my life and how she changed the way I saw the world. At the time, Esmé was about 18 months old. She was then, as she is now, non-verbal. She remained undiagnosed and was experiencing clusters of about 14 seizures once a week that would cause her to desaturate and turn blue. We had tried a number of drugs that she reacted to (or that just didn’t work). And we were terrified. Writing The Cute Syndrome became a way for me to maintain my sanity and to process what was happening in our world. But more than that, it became a way for my little girl’s voice to speak out through mine—for me to show evidence of her tremendous will, her joyfulness, her curiosity, all in spite of her discomfort and fear. There were times that I could feel her there as I wrote, reassuring me that I could, in fact, do this…promising smiles and giggles were just around the corner. She was helping lead me away from the anger that would leak around the edges of my words toward a determined certainty that everything would be “OK” in our own way. I began to feel that, much as I could feel like I was drowning in a sea of seizures and vomit and anxiety, I had no excuse not to happily speak up about what was in my heart. As Esmé was undiagnosed at the time, I had no disorder to address directly, and so my energy was spent working on more general terms, hoping to better the Medicaid system in some small way, to open people’s eyes about children with disabilities, to aid in their understanding of feeding tubes, to encourage (and occasionally demand) hospitals and doctors to provide better and more understanding systems to support patients and families like ours. Through this work I became acquainted with my new, louder voice…a voice that had to be loud because it needed to speak for me and for my girl. When Esmé received her diagnosis of a mutation on the gene PCDH19, we found ourselves in a very small community of girls and women diagnosed with this disorder—about a 100 worldwide—and their families. PCDH19 Female Limited Epilepsy (FLE), which is also known by the antiquated and misleading name of Epilepsy in Females with Mental Retardation (EFMR), causes severe drug-resistant epilepsy and a wide range of developmental delays and behavioral challenges. The most common symptoms of the disorder include clustering seizures that often cause severe apnea. While it has been diagnosed in a limited number of cases, it is anticipated to be a much more widespread disorder as testing availability improves. The small number of diagnosed patients meant that I very quickly became acquainted with a number of active parents through a Facebook group. As a group, we were discovering defining characteristics about our daughters that specialists would have no way to know, given their limited access to cases. In this group, I found a number of kindred spirits—families battling through seizures and behavioral challenges, but all of whom were wonderful advocates, anxious to help their daughter, niece, or other loved one’s cause in any and every way possible. As I became increasingly active in this community, it became obvious to me (and those around me) that The Cute Syndrome might have a wider role to play in the world of Esmé’s disorder. Esmé’s and my combined voices had become rather strong, and I could not think of a better way to use this voice than to bring attention to this disorder, helping to raise awareness, gather research money, support the girls living with PCDH19, and draw researchers to this cause! 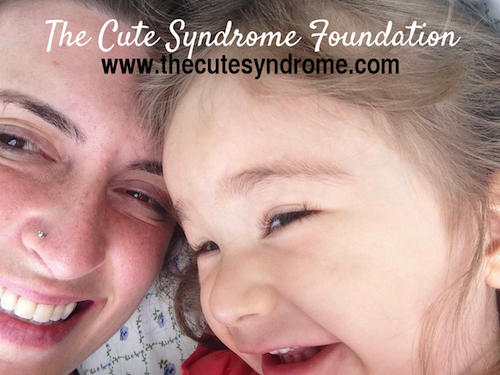 The Cute Syndrome Foundation became an entity in May of this year. And we took off right out of the gate, raising almost $25,000 in six weeks thanks to a matching donation of $10,000 from an extremely generous donor. We have just celebrated our first annual Catch the CUTE Cocktail Party and Silent Auction, which has brought our total raised to over $40,000. We have committed our money for this year to co-fund two $50,000 PCDH19 research grants this fall with our partner organization, Insieme per la Ricerca PCDH19 – ONLUS, in Italy. We are also partnered with Positive Exposure to do a series of photo shoots of our beautiful girls with photographer Rick Guidotti. And we have partnered with TinySuperheroes to create the TinySuperheroes Super CUTE Troop—empowering our girls and their helpers with superhero capes. It is truly amazing to see the support we have gotten from our network of friends, colleagues, family, and the loved ones of those affected by PCDH19. Almost everyone I know has supported us in one way or another. Several of our friends and family members have committed almost their entire charitable giving for the year to the Cute Syndrome Foundation. A number of people have generously donated time, food, and items for auction to the Cute Syndrome. Every time I ask, I seem to have a line of people ready, willing to help—touched by Esmé’s story and our devotion to this cause. I am not going to say that this has been easy. It certainly has involved a lot of hard work, but it has also felt fated insofar as the Cute Syndrome Foundation has given me a venue to use the rather divergent skills I spent my early adult years gathering, admittedly somewhat haphazardly: graphic design, rhetoric, web design, communication, medical knowledge, and, most importantly, a firm grasp of Esmé and, now, PCDH19 FLE. Esmé is, by no means, the “face” of PCDH19 FLE—she is only one of a tremendous group of beautiful, funny, clever, and determined “sisters.” Members of our PCDH19 community are all working hard to bring this disorder into the light. Our girls are wearing their new capes to let the world know how strong they are. And their parents are wearing the giraffe print awareness ribbons to let the world know how important this cause is. And each and every day these girls are inspiring their parents to be advocates—just as Esmé does for me. Hillary Savoie is Esmé’s Maman, the Founder of The Cute Syndrome Foundation and a doctoral candidate in Communication and Rhetoric. Hillary writes a blog and administers the Facebook page for The Cute Syndrome. Hillary is also Chief of Communications at the Feeding Tube Awareness Foundation.